NORMA AUREA RANGEL-VáZQUEZ, División de Estudios de Posgrado e Investigación del Instituto Tecnológico de Aguascalientes, Ave. López Mateos # 1801 Ote. Fracc. Bona Gens CP. 20256 Aguascalientes, Aguascalientes, México. FRANCISCO RODRíGUEZ FéLIX, Departamento de Investigación y Posgrado en Alimentos. Universidad de Sonora, Blvd. Luis Encinas y Rosales S/N Col. Centro, Hermosillo, Sonora, México. BáRBARA-SUSANA GREGORí-VALDéS, Institute for Biotechnology and Bioengineering, Centre for Biological and Chemical Engineering, Instituto Superior Técnico, Av. Rovisco Pais 1, 1049-001 Lisboa, Portugal. Computational chemistry allows using various models analyze and predict the behavior of single and composite materials to determine the composition of new materials. It should be noted that a model is a representation of the construction and working of some system of interest. A model is similar to but simpler than the system it represents. One purpose of a model is to enable the analyst to predict the effect of changes to the system. On the one hand, a model should be a close approximation to the real system and incorporate most of its salient features. On the other hand, it should not be so complex that it is impossible to understand and experiment with it. A good model is a judicious tradeoff between realism and simplicity. This book is aimed at researchers and students with basic knowledge of computational chemistry, interested in analyzing and discussing the structural properties of different polymers. 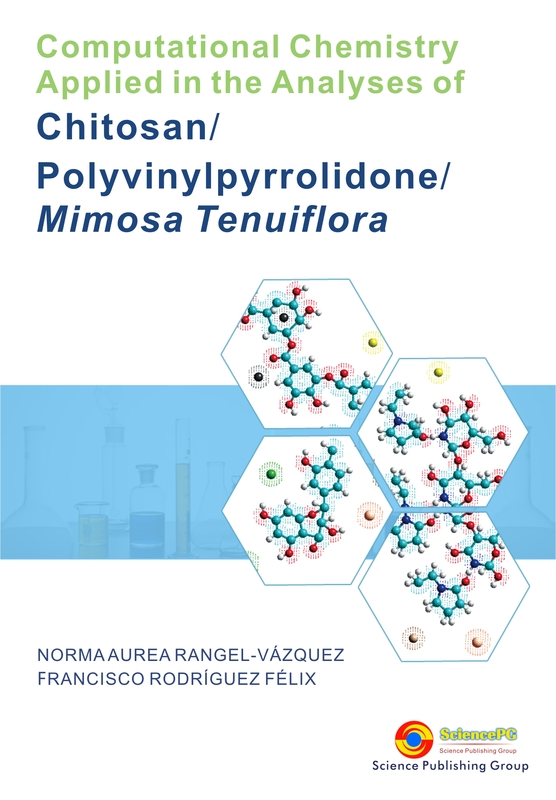 It should be noted that this book is carried out an analysis of polymers such as Chitosan, PVP and MT as well as the structure of the model from the mixture of these polymers using a computational analysis using a comparison between PM3 and AM1 semi-empirical methods, respectively. In this case, Chitosan is a linear polysaccharide composed of randomly distributed β-(1-4)-linked D-glucosamine (deacetylated unit) and N-acetyl-D-glucosamine (acetylated unit). It is made by treating shrimp and other crustacean shells with the alkali sodium hydroxide. Chitosan has a number of commercial and possible biomedical uses. It can be used in agriculture as a seed treatment and biopesticide, helping plants to fight off fungal infections. In winemaking it can be used as a fining agent, also helping to prevent spoilage. In industry, it can be used in a self-healing polyurethane paint coating. In medicine, it may be useful in bandages to reduce bleeding and as an antibacterial agent; it can also be used to help deliver drugs through the skin. Finally, Mimosa tenuiflora, syn. Mimosa hostilis (Jurema, Tepezcohuite) is a perennial tree or shrub native to the northeastern region of Brazil (Paraíba, Rio Grande do Norte, Ceará, Pernambuco, Bahia) and found as far north as southern Mexico (Oaxaca and coast of Chiapas). It is most often found in lower altitudes, but it can be found as high as 1000 m. Mimosa tenuiflora is a very good source of fuel wood and works very well for making posts, most likely because of its high tannin content (16%), which protects it from rot. Due to its high tannin content, the bark of the tree is widely used as a natural dye and in leather production. It is used to make bridges, buildings, fences, furniture and wheels. It is an excellent source of charcoal and at least one study has been done to see why this is the case. Finally, an important difference that has this book is, the analysis and determination of properties such as FTIR, electrostatic potentials and structural parameters of polymers in an individual way and in union, to propose a structure for a new material that has great features to be applied in the medical field and thus contribute to a need in society in general.